David Jones / PA Archive/Press Association ImagesMike Ashley. Sports Direct’s billionaire founder Mike Ashley will answer MPs’ questions on the chain’s working conditions today. MPs will grill him and other Sports Direct executives at 10.00 a.m. BST (5.00 a.m. ET) this morning. You can watch the hearing here. Ahead of the hearing, Ashley has admitted for the first time that there are issues with Sports Direct’s search policies and working conditions in a letter sent to Sports Direct’s 27,000 staff and reported by the Daily Telegraph overnight. Ashley initially invited MPs to visit Sports Direct’s warehouse facility in Shirebrook, Derbyshire, suggesting he did not think there were any problems. MPs refused the invitation. 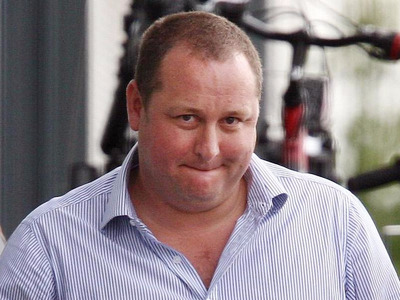 The letter also revealed that Sports Direct CEO Dave Forsey will not be taking his 4-year share bonus, worth as much as £4 million ($5.8 million). The Telegraph suggests the leaking of the letter is an “olive branch to MPs” ahead of today’s hearing. The BIS Select Committee inquiry concerns allegations made in late 2015 by the Guardian, including that the company is effectively paying workers less than minimum wage because of lengthy compulsory searches and that some workers were so scared to take sick leave that they called ambulances to the office. In February, Ashley was also criticised by a series of major investors for treating Sports Direct like “his own personal play-thing” and acting like the company’s chief executive, despite currently holding the position of vice chairman. Sports Direct shares have collapsed over 40% since the initial working condition allegations were made.